The Savage Boar team (from left): Brenda Wilbur, Alex Wilbur and John Barrom. Patience is a virtue in most endeavors, but it's an absolute necessity in the booze biz. Aspiring distillers not only have to go through the painstaking process of learning how to craft something delicious out of basic, raw ingredients and then actually do it; they also have to take that product and stash it away for months or years at a time to create the smooth spirit they dreamed of when they first started. 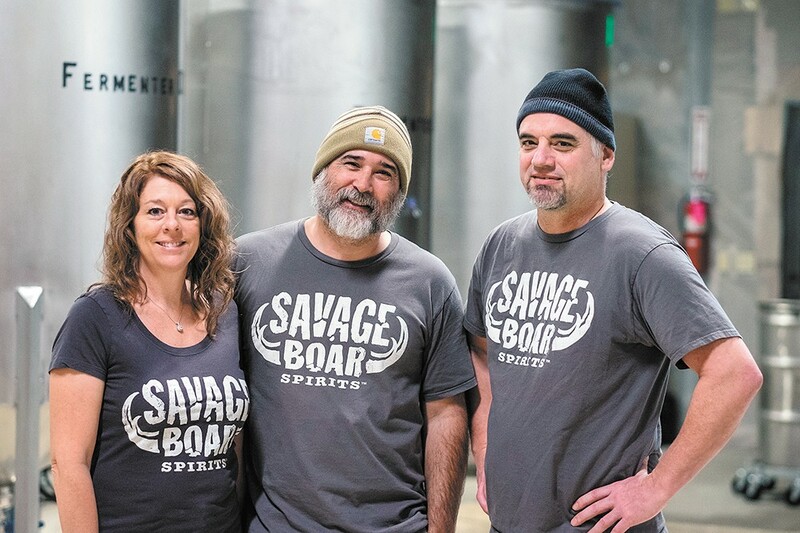 That's why so many distilleries — like the new Savage Boar Spirits in Airway Heights — start with vodka as their first product. Relatively speaking, a skilled distiller can make a market-ready vodka pretty quick, allowing a young business to get off the ground while grander visions of gins and whiskeys wait for another day. The Savage Boar owners — John Barrom and husband-and-wife team Alex and Brenda Wilbur — have been methodically working on their business since 2014. That's when Alex Wilbur left his IT job at Gonzaga University to become the full-time tender of mash pots, stills and filters in their nondescript building a couple blocks off Airway Heights' main drag. Barrom and Brenda Wilbur still work full-time at their day jobs between hustling on the marketing, distribution and long-term planning for their nascent beverage. After the decision to create the business, the team spent two years outfitting their facility, going through the licensing process, researching, building and testing the equipment, and figuring out things like logos and bottle sizes before any of their vodka was actually ready for public consumption. "When you tell a bunch of artists you want a boar's head, it's unreal the variety of what you get back," Barrom says of the process that ultimately landed on a logo from artist Sheila Evans and a boar illustration by Shannon Potratz. Alex Wilbur at work in the Savage Boar distillery in Airway Heights. The trio has learned new things at every turn. Brenda Wilbur says they were "focused on whiskey at the beginning" but quickly pivoted to vodka, and Barrom adds that almost every decision in developing Savage Boar has led the team to a point requiring ever more choices they hadn't anticipated. "At first we'd be heading down one path and then fork off into something else, and it would fork again," Barrom says. "We had a rough time with picking a bottle," Brenda Wilbur adds, "and then we just sort of said, 'Screw it, just go with something!' We had paralysis by analysis." 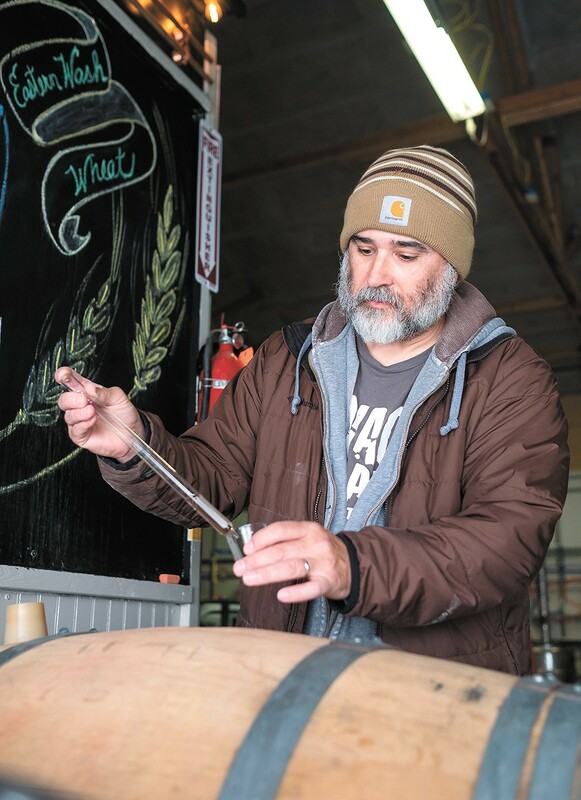 A tip from a bartender to keep the bottle simple and easy to grab helped the trio, and they've talked to people at all levels of the industry to help figure out how best to approach entering the fray of craft distilling. "Our philosophy was to start small," Brenda Wilbur says, and the methodical approach has helped them navigate some frustrating aspects of starting a new booze business. How tough it is to get their vodka in front of bar and restaurant owners was surprising at first — "I really thought there would be more enthusiasm about a new local product," Barrom says. "It's very hard to compete." — but the challenges led to some creative marketing ideas, like serving Savage Boar at the Cheney and Ritzville rodeos. The nonstop lessons extend to Alex Wilbur, who basically taught himself how to distill once the team decided to launch the business. "I was watching the progression of how beer hit the scene," Alex Wilbur says. "It was here for 10 or 15 years, and then it just exploded. Now beer is like your neighborhood bakery or your neighborhood restaurant. People stop in to have a beer after work and they're having local beer. And we're watching hard liquor start to do the same thing." He's self-deprecating about his skills, but the results of only his second batch of vodka — currently in bottles around town and at the distillery — are tasty, particularly mixed with fruit juice. And the process is speeding up for him now that he has experience working with the Eastern Washington wheat used for his vodka. "Me and John's first mash-in was incredibly fascinating," Alex Wilbur says. "It actually took me like 12 hours to grind the first batch of wheat. It was exhausting and nightmarish." "John was like, 'I don't think this is going to work,'" Brenda Wilbur adds with a laugh. "There's got to be a way to streamline this!" Barrom recalls thinking. "At every step of the process there's been like a 'No way I'm doing that again,'" Alex Wilbur says. "So you find the better way. A lot of trial and error. If I had been smart, I would have spent more time and maybe $5,000 for a more formal [distilling] education. I would have been up and cooking faster. On the other side of that, what you learn the hard way you never forget, and the journey's been amazing to get where it can go in the bottle." The team already has plans afoot for increasing production in 2018 to make more vodka, as well as starting on gin production, adding some flavored vodka (jalapeno, anyone?) and increasing their public outreach with events, an online shop and a revamped tasting room. If that seems like a lot to undertake for a young business, that's another lesson they're learning. As patient as one has to be to learn the craft and make a tasty beverage is as fast as things start moving once your product catches on. Barrom says that even though they're just getting started, they're already hearing from customers about what's next. The original print version of this article was headlined "Slow Boil to Success"